You’ve no doubt noticed milder temperatures and sunnier mornings in recent weeks but there’s still a bit of time until Spring makes its official debut. Farmer’s markets have quickly become a Saturday staple in most communities, but winter farmer’s markets are also gaining traction. 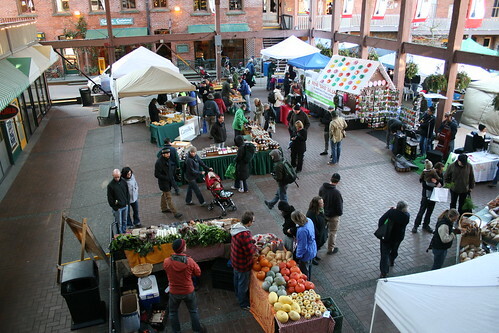 Since 2010, the Victoria Downtown Public Market Society has brought the fresh, local flavour of farmer’s markets to the Victoria area and this year the brand-new winter market has already proven popular. On the first and third Saturday of each month, area farmers, food vendors, fishermen, cheese makers, bakers and live musicians have been converging on Market Square’s inner courtyard. This free, family-friendly gathering provides a place for residents to obtain high quality, local feast-worthy food while directly supporting the community’s economy. The winter farmer’s market will be held on February 18th – for this weekend only – at Seedy Saturday at the Conference Center. You can find the winter farmer’s market at its usual spot on March 3rd and 17th before vendors will be gearing up for Spring and Summer! For more information on the Victoria Downtown Public Market Society and its events, visit them online, on Facebook or on Twitter.